This multi-functional fishing plier is very practical when fishing. It can help you easily cut lines, pick up lines, tune lures, split rings, remove hooks, crimp leads, etc. An indispensable companion for your fishing activity. Made of good quality stainless steel material, sturdy and corrosion-resistant. It can cut any type of fishing line and remove the hooks easily, very helpful tool for fishermen. 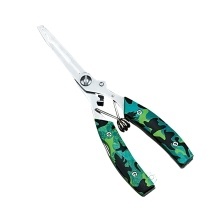 Ergonomic handle, easy and comfortable to hold the plier to use. Can be widely used to take hook, take fish, cut line, replace hook, clip line, etc. 1. Due to the different monitors and light effects, the actual color of the product maybe a slightly different from the picture color.